Park City's Twisted Fern offers great eats away from the Sundance crowd. If you're planning on trekking up the mountain to ski or hit up the Sundance Film Festival, you'll no doubt be looking for a place to eat. While Main Street in Park City is a treasure trove of fine dining options, it's also a logistical nightmare this time of year—unless you're hoping to spot a wandering celebrity, it's best to seek out other options for your dining needs. Luckily, Main Street isn't the only place in town where you can get a decent bite to eat. The farm-to-table bastion known as Twisted Fern (1300 Snow Creek Drive, Ste. RS, 435-731-8238, twistedfern.com) has a well-stocked menu of contemporary American cuisine and is far enough from the bustle that you can still find parking. Twisted Fern opened in June 2017 as the brainchild of local chef Adam Ross, who moved to Park City after graduating from culinary school in Denver. It wasn't long before he worked his way to head chef at Bistro 412, which was a Park City mainstay until it closed in March of last year. During his time at Bistro 412, Ross transformed the menu to reflect his from-scratch attitude, which now is on full display at Twisted Fern. The menu offers many options for gluten-free, vegetarian and vegan diners, and its seasonal variety keeps things interesting throughout the year—plus, they have one of the most inventive kids' menus that I've ever seen, which was a good excuse to bring my 1-year-old along for the trip. My family and I visited for an early dinner during the week, so we didn't expect the place to be overly crowded—and it wasn't. Despite the ample seating options we saw before us, our host promptly asked whether or not we had a reservation—we didn't. After a few moments of scrolling through his iPad, our host informed us that, since the next reservation was in an hour and a half, he supposed he could seat us—but we had to be quick! Eyes rolled from all three members of my party. The restaurant itself is comfortable, and despite its location in a strip mall off Kearns Boulevard, it's got a lovely patio with a nice view of the mountains. Of course, this time of year that patio is blanketed by a few feet of snow, so I don't recommend patio dining here unless it's part of your polar bear challenge. The menu really does have a nice range of contemporary American dishes, and all of them make sure you eat your seasonal root vegetables. Based on our server's recommendation, we ordered a starter of fried Brussels sprouts ($10); the shorty melt ($16), an open-faced take on a classic Reuben; and the chicken-fried Portobello ($17), a vegetarian-friendly interpretation of chicken-fried steak. We ordered the kids' cheddar burger ($8) for our 1-year-old—she's been in a burger and sandwich mood lately, and she found this burger very much to her liking. Based on this order alone, it's easy to see that Chef Ross is a fan of reinterpreting comfort food staples. Fried Brussels sprouts are ubiquitous at contemporary American places, but the huckleberry vinaigrette and apple butter were nice touches. I did find a few smatterings of undercooked garlic that gave my taste buds an unexpected wallop, but no harm done. The shorty melt was the winner of the evening—the vinegary goodness of the pickles and sauerkraut play well with the creamy, house-made Thousand Island dressing. The braised short rib melts in the mouth, and the chef gets props for adding a fried egg to a Reuben sandwich. My only gripe was that our portion was a bit small. I loved the concept of the chicken fried Portobello a bit more than I did the execution, but it's a truly inspired idea. Fully embracing the Portobello mushroom's ability to stand in for hamburger patties, this dish consists of a sliced Portobello that has been deep fried in a wonderfully crispy buttermilk and flour coating. It arrives on top of cauliflower grits, asparagus and green peppercorn gravy. This dish's cardinal sin was simply a lack of seasoning—I should have saved some of that garlic from the Brussels sprouts to mix with my cauliflower grits and gravy. All the same, it's an inventive dish that makes the joy of chicken-fried steak more accessible, which is God's work. 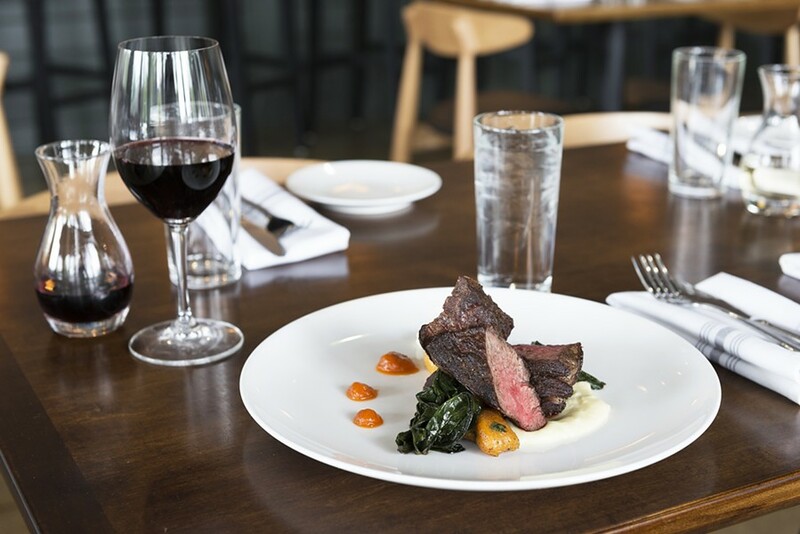 Outside of an overzealous front-of-house experience and a few flat notes when it came to seasoning and execution, Twisted Fern remains a great option for Park City dining that's blissfully removed from its more high-traffic areas. Just make sure you have a reservation if you want an evening free from snorts of derision. Open: Monday-Sunday, 11:30 a.m.-9:30 p.m.